This laid-back, mostly cool jazz album with echoes of the West Coast 1950s sound also bespeaks a certain dramatic intensity. Further, it invokes a shade of country blues as it goes along. 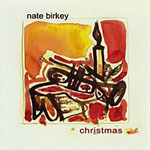 Nate Birkey's trumpet and vocal renditions of both his own songs and some standards are enjoyable to hear, partly because they are strongly reminiscent of Chet Baker (with muted resonances to Miles Davis) while representing Birkey's own persona and interpretations, which possess a sincerity that contrasts with Baker's existential sense of being "lost" in space. Birkey probes the depths of the blues idiom without ever losing faith in something meaningful beyond the horizon. With the lines, "I'm falling in love again, And if I lose or win, How will I know?," from Willie Nelson's "I'm Falling in Love Again," he reaches poignant depths of woundedness that recur in "Little Boy Lost," but Birkey nevertheless conveys a feeling of acceptance and hope. He thus probes our human vulnerability without falling victim to it. He exemplifies in music what the American poet, James Wright, called "the pure clear word"honest, heartfelt expression that never lapses into sentimentality or self-pity. There are also times when the pace picks up, and the group swings with lusty enthusiasm. On the two Birkey originals"The Promise," featuring fine percussion work with a Latin flair, and "Tuesdays on the Ridge"saxophonist Sal Giorgianni does some lively solo work, backed by pianist Jim Ridl's usual sharp comping. Birkey, who not too long ago migrated from Los Angeles to New York City, has found his element on the East Coast with a group of sidemen who complement him brilliantly, bringing a touch of warmth and complexity into the equation while highlighting Birkey's cool simplicity. Ridl, bassist Tony Marino, and drummer Marko Marcinko have all done time with the masterful saxophonist David Liebman, which means they know jazz inside out and are instinctively in synch with one another. 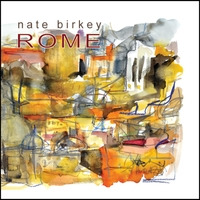 Giorgianni possesses a gruff yet lyrical timbre reminiscent of Zoot Sims, while guitarist Vic Juris, another Liebman alum, evokes a country flavor in a cameo appearance on Nelson's tune and lets it all hang out on Birkey's "Sing to Me." This is an album that can be enjoyed from the standpoint of the instrumental accompaniment alone. Too many jazz recordings today reflect attempts to squeeze the last drop of virtuosity and clever turns of phrase from the proud legacy of the idiom, mixing it with various flavors of classical and world music. This album is instead straightforwardly a man's expression of who he is, and that is the true essence of jazz. Eminently listenable, Almost Home is also a valid musical expression of the human heart. Track Listing: Bianca; All Of You; Falling; Almost Home; I'm Falling In Love Again; The Promise; Little Boy Lost; Tuesdays On The Ridge; Sing To Me; Theme from Cinema Paradiso. 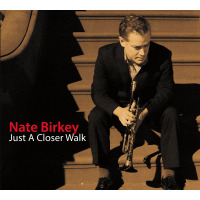 Personnel: Nate Birkey: trumpet, vocals; Sal Giorgianni: sax, flute; Jim Ridl: piano; Tony Marino: bass; Marko Marcinko: drums; Steve Rudolph: piano; Vic Juris: guitar; Cafe: congas.